“The Batote- Kishtwar Highway, connecting twin districts of Doda and Kishtwar with rest of the state, was closed again on Sunday morning when a huge landslide blocked the road at Ragi-Nullah – 21 km from Doda. 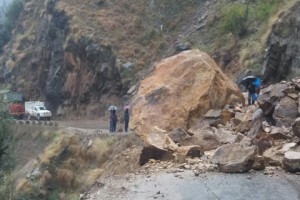 After remaining closed for 18 hours due to landslide and shooting stones at half-a-dozen places, the road was opened for traffic yesterday afternoon. Today morning, a massive landslide and a huge boulder blocked the road near Ragi-Nullah on Batote-Doda stretch.